Almightly and ever-living God, your Spirit made us your children, confident to call you Father. Increase your Spirit within us and bring us to our promised inheritance. Grant this through our Lord Jesus Christ, your Son, who lives and reigns with you and the Holy Spirit, one God, for ever and ever. Amen. Peter approached Jesus and asked him, "Lord, if my brother sins against me, how often must I forgive him? As many as seven times?" Jesus answered, "I say to you, not seven times but seventy-seven times. That is why the Kingdom of heaven may be likened to a king who decided to settle accounts with his servants....'Should you not have had pity on your fellow servant, as I had pity on you?' Then in anger his master handed him over to the torturers until he should pay back the whole debt. So will my heavenly Father do to you, unless each of you forgives his brother from his heart." 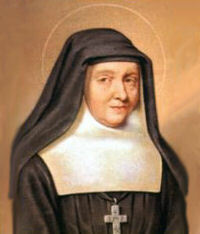 Jane Frances Fremiot de Chantal was the foundress of the Order of the Visitation of Mary. She was born in 1572 and came from a noble family, her father gave her in marriage to the Baron von Chantal in 1592. As mother she most zealously instructed the children in the ways of virtue and piety and in the observance of every divine precept. With great generosity she supported the poor and took special joy in seeing how divine Providence often blesses and increases the smallest larder. Therefore she made a vow never to refuse anyone who asked for alms in the Name of Christ. Patron: Forgotten people; in-law problems; loss of parents; parents separated from children; widows. Learn more about the Visitation nuns founded by St. Jane Frances; consider having a spiritual director. 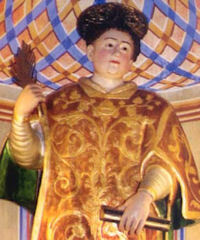 St. Francis de Sales, in speaking about the spirit of the institute he had founded with St. Jane, declares that it is "a spirit of profound humility towards God and of great sweetness towards our neighbor, inasmuch as there is less rigour towards the body, so much the more sweetness must there be in the heart." And because "this Congregation has been so established that no great severity may prevent the weak and infirm from entering it and giving themselves up to the perfection of divine love," he adds playfully: "If there be any sister so generous and courageous as to wish to attain perfection in a quarter of an hour by doing more than the Community does, I would advise her to humble herself and be content to become perfect in three days, following the same course as the rest. For a great simplicity must always be kept in all things: to walk simply, that is the true way for the daughters of the Visitation, a way exceedingly pleasing to God and very safe." Read the Treatise on the Love of God written by St. Francis de Sales for St. Jane and her sisters; donate food to the food pantry at your church, if you have more time volunteer to help. Read some of the letters of St. Jane Francis. St. Jane Frances was willing to change her plans when God asked her to, read Abandonment to Divine Providence by Jean-Pierre de Caussade online or purchase a copy, try to become aware of God's Will in the small contradictions you experience each day. Say the prayer of abandonment written by the saint. St. Jane Frances helped the poor and the sick, have your children construct a collage of the corporal and spiritual works of mercy (they can draw the pictures if none are available from magazines).